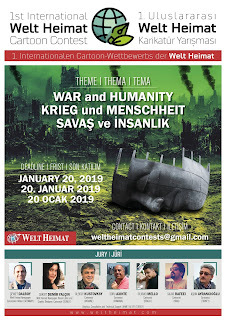 The Welt Heimat Newspaper published monthly in German and Turkish in the German state Baden-Württemberg, approves of organizing a cartoon contest in its 4th year. This international competition is about cruelty of war, destruction, demolition of human soul, despair against refuge and war and dangerous developments in weapon technology. The aim here is to issue a call to cartoonists living all over the world to be sensible to humanity in the frame of humor. 1- The competition is organized internationally and is open to all amateur or professional cartoonists. 2- The subject of the competition is "War and Humanity". Under this title, topics such as war, massacres, armaments, genocides, refugees, children in war, migrations, crimes against humanity, which have affected the whole world and humanity for centuries, can be handled. 3- As the competition is organized on an international scale, it is necessary to prepare the works without writing. 4- Technical use is free in the works to be sent to the competition. The size of the artwork should be at least A-4 (29.7 cm x 21 cm), A-3 (29.7 cm x 42 cm), 300 dpi, and JPG format. 5- The works to be sent to the competition may have been published before but they should not have been awarded in any competition. The award will be canceled if the award-winning works are documented to have been awarded in another competition. Objections against similar and stolen works will be taken into consideration. 6- It is possible to participate in the competition with maximum 5 works. Participants will not be awarded more than one award. 7- Works for participation in the contest will be sent to e-mail: weltheimatcontests@gmail.com . The participant should add a photograph and a resume to the mail along with the cartoon. 8- The deadline for entry to the competition is January 20, 2019. Works submitted after this date will not be evaluated. 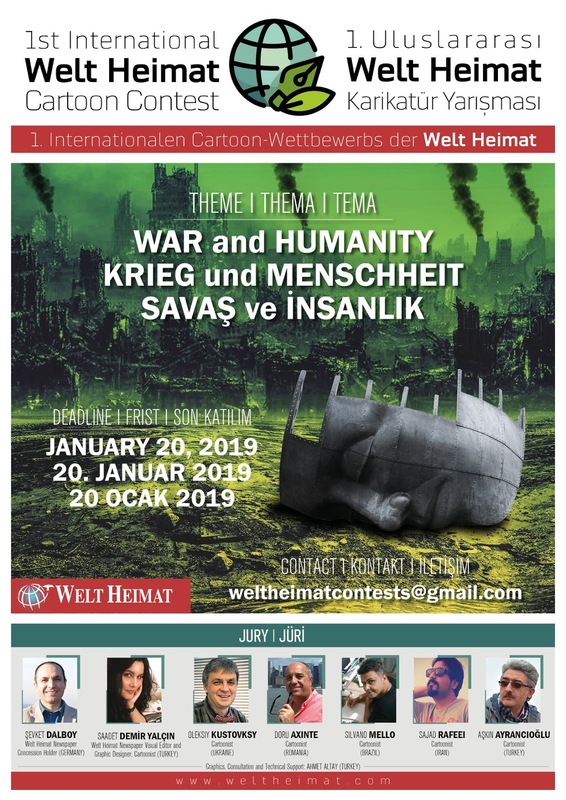 9- The Welt Heimat newspaper will also have the right to use the cartoons sent to the competition in various media and publications, newspaper and internet sites. Participants will acknowledge that they accept the conditions of the competition by sending works to the contest, and will not seek any future compensation in the event that the works they submit are used in the places specified in this specification. 10- Members of the jury, members of the organizing committee and their first-degree relatives cannot participate in the competition. 11- Cartoons found appropriate by the jury will be exhibited at various events in different countries such as Germany and Turkey. Aşkın Ayrancıoğlu - Cartoonist / Turkey. 13- The results of the competition will be forwarded to award winning artists and press organs. 5 Honorable Mentions (awards given by various organizations). 15- All participants will be sent a certificate of participation. First e-album of the competition will be published. Being a strong theme very much relevant to the present scenario of the world we live, the incentive prize do not justify to attract more participants in this project.